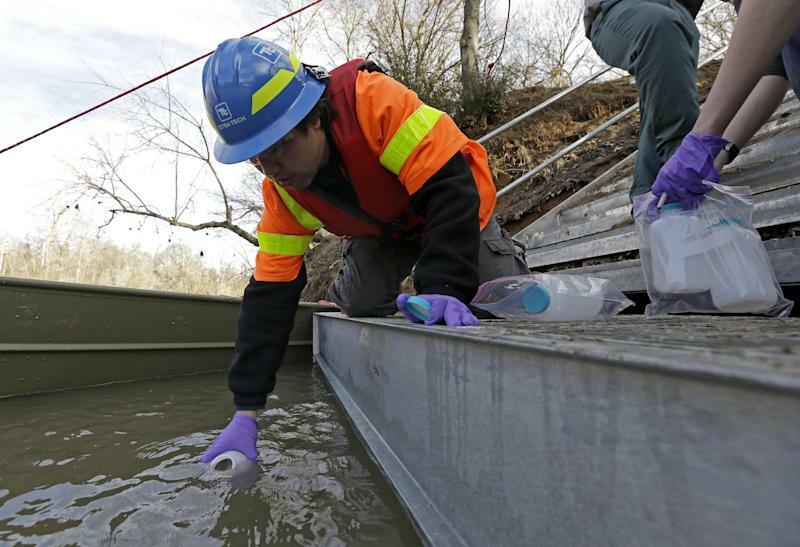 Since the leak was first discovered by a security guard Sunday afternoon, Duke estimates up to 82,000 tons of ash mixed with 27 million gallons of contaminated water has spilled into the river. Officials at the nation's largest electricity provider say they cannot provide a timetable for when the leak will be fully contained, though the flow has lessened significantly as the pond has emptied. 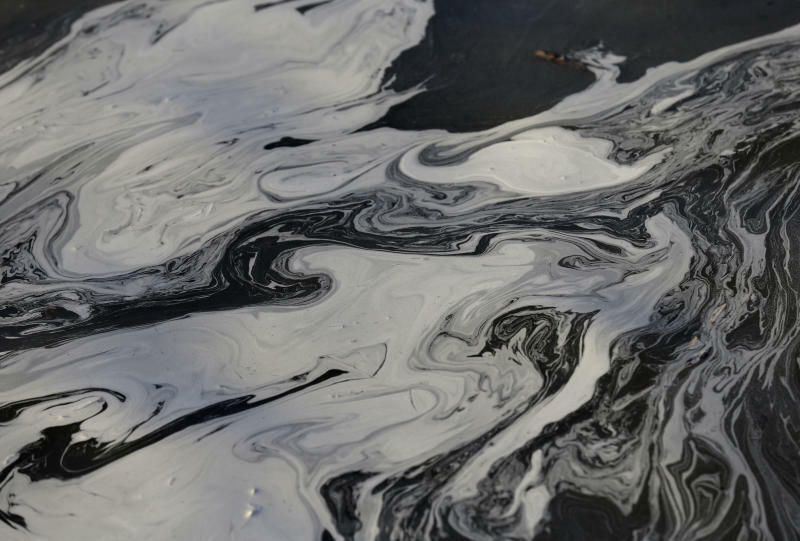 An Associated Press reporter canoed downstream of the spill at the Dan River Steam Station and saw gray sludge several inches deep, coating the riverbank for more than two miles. The Dan had crested overnight, leaving a distinctive gray line that contrasted with the brown bank like a dirty ring on a bathtub. "How do you clean this up?" he said, shaking his head as he churned up the ash with his paddle. "Dredge the whole river bottom for miles? You can't clean this up. It's going to go up the food chain, from the filter feeders, to the fish, to the otters and birds and people. Everything in the ecosystem of a river is connected." Environmental regulators in North Carolina say they are still awaiting test results to determine if there is any hazard to people or wildlife. Coal ash is known to contain a witch's brew of toxic chemicals, including lead, arsenic, mercury and radioactive uranium. Personnel from Duke Energy and an alphabet soup of state and federal agencies, including the U.S. Environmental Protection Agency and U.S. Fish and Wildlife Service, traveled the river in motorboats Wednesday, collecting water and sediment samples. A command center has been set up at the power company's facility in Eden. Environmentalists and government regulators have been warning for years that the 31 ash ponds at Duke's power plants in North Carolina had the potential for calamity, especially after a similar pond in Kingston, Tenn., burst open in 2008. "Even without a spill, these settling ponds have been releasing continuous contamination into the rivers downstream from coal-fired power plants," said Avner Vengosh, a professor of geochemistry at Duke University, which was named for the same family that founded the power company. "We are committed to closing the ash basins at many of our retired coal plants across North Carolina," the company said in a statement Wednesday. "Duke Energy customers continue to benefit from more affordable rates because coal remains part of our diverse fuel mix." They said they will still fish this year, but don't plan to eat what they catch. "We're gonna eat what we have in the freezer now," said Elsie, 71, casting a wary eye at the gray water.